Is it worth driving to Putra Jaya for this meal? Well that would depend how much you wish to impress your date. If you value outstanding food, exemplary service and an elegant yet relaxed atmosphere, then the answer is a resounding yes! Don’t have a date? Take me! I’ll drive there with pleasure! 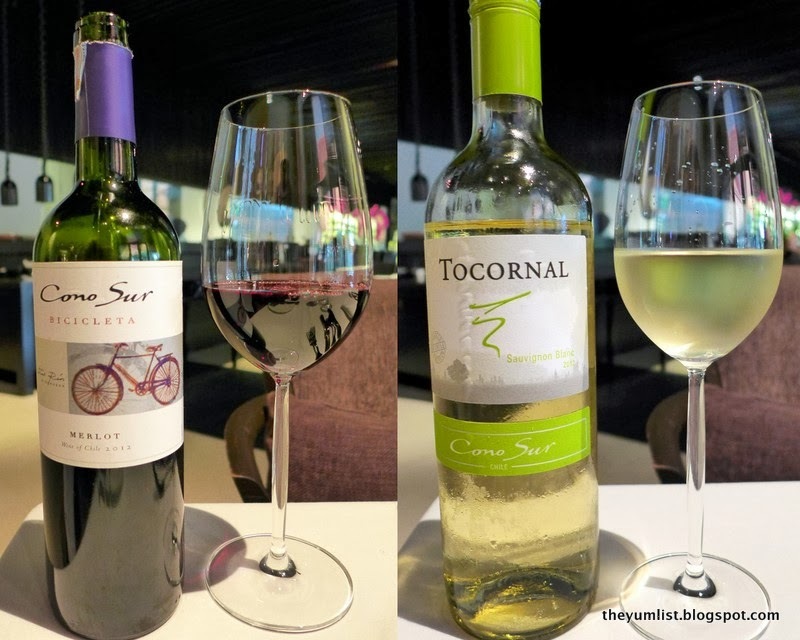 The Chilean Tocornal 2012 from the Valle Central is a fairly typical refreshing Sauvignon Blanc, with bright yellow and green hues. It is delicately aromatic with notes of lemon and grapefruit. A lively light wine that we enjoy sipping. Red and White Wine by the GlassOur ‘Amuse Bouche’ is all simplicity, a splash of colour perched on a clean white plate. This mini Caesar salad, in a delicate lacy cheesy basket with teeny tiny cubes of cured beef, is a lovely fresh combination of tastes and augurs well for what is to come. Amuse Bouche – Mini Caesar Salad CupsThis Valentines menu has been created by Chef Alexander Waschl as a Symphony of the Senses. Which seems very fitting for the occasion… let’s see if he can set our senses on fire. First comes Subtlety… This is divinely elegant food, a shiny salad of fine herbs conceals an ambrosial Smoked Hamachi Sashimi. I try it with the Sour Cream Mousse which defies description being both light but firm. But the Bloody Mary Sorbet is its own revelation, cool and sticky with the perfect touch of chili. The balance of flavours just wakes up the palate and my tongue is buzzing. It’s already a contender for dish of the year. Smocked Hamachi Fish Sashimi Sour Cream Mousse, Bloody Mary Sorbet, Herb SaladAfter Subtlety we move to Sensitive… Creamy Garden Pea Soup melts over the tongue leaving a gently relaxed feeling and then a deep warmth in the belly. Crisp and light curry tinged rice flour adds a speckle of spice to the dense black Tiger Prawn which we dip into our verdant pools. It’s an exotic, original and sensual combination. Garden Peas Soup, Black Tiger Prawn TempuraInsanity is as it sounds, indescribable… This textured and striated dish has me digging for descriptions, but it’s so unusual, it’s outwitting even me. Honey glistens on top of rose water sorbet, which on tasting evokes memories of homemade Turkish delight. The milky mousse is more of a fudge consistency. I can only tell you to take both together for the intense flavour and texture combination. Rose Water Sorbet, Honey Milk MousseWho could fail to feel Joyfulness with a double dose of truffle potatoes? The Angus Tenderloin is seared to perfection, with a powerful meaty taste. Every mouthful confirms that only top quality produce is on offer. The clear gravy sings and even the veg are mouthwatering buttery slivers. Grilled Black Angus Beef TenderloinThe other choice of main is Obstinacy, which I take as reference to the persevering qualities of the Salmon in its life before the dish. Glistening flakes of the freshest fish fall off our forks, just barely cooked to be mouthwateringly melting. Sweet, dense plucked crabmeat, honey tinged carrot and pickled fennel complete a moistly marvelous dish. Olive Oil and Spice Poached Salmon Carelessness appears to be anything but… Our final dish resembles a three dimensional Kandinsky sculpture. It’s been a while since I have seen such perfect presentation. Well, perhaps Chef means be careless with your calories at times… No matter, I’m salivating to see two of my favourites in this coolly composed dish. A crisp toasted brûlée crunches through to warm eggy custard, while the chocolate sorbet is dark and cool with a slight orange undertone. Cool and warm, dark and colourful, this is fun and clever way of ending our extremely entertaining meal. White Chocolate Crème Brule, Sorbet from 64% Dark Chocolate and Berries Our senses are satiated and my only complaint is I cannot stay the night in these divine surroundings. Seriously, dear reader, you are on the brink of having one of the most creative and delicious meals of your life. Such ambrosial offerings don’t appear that often in Kuala Lumpur. The main courses are well-cooked classics, but every other course is something clever and original. Take your chance, get in your car and have an evening I promise you will never forget.